Ford has recalled 2001 - 2004 Escape vehicles to fix a problem nwith the cruise control. This recall also covers 2001 - 2006 & 2008 Mazda Tributes for the same problem. Rollovers during crashes are common. But the advent of sport utility vehicles (SUVs) has brought a dramatic rise in rollovers, with deadly results. Many SUVs have been shown to be much more likely to roll over, resulting in their roofs collapsing, injuring and killing occupants. Companies that design and manufacture vehicles are responsible for making them as safe as possible. If they design and manufacturer unsafe products and people are injured or killed, companies should pay the injured people's medical bills, pain and suffering, lost wages, and any other consequences. But they will not do so voluntarily -- if you want justice, you must hire an experienced personal injury lawyer. George Bellas, of Bellas & Wachowski Attorneys at Law , is one of the nation's leading personal injury lawyers for SUV rollover accident litigation. In one case, he obtained a $22 million SUV rollover settlement after a 1992 Ford Explorer rolled over and left two teenagers dead and another a quadriplegic. He is frequently asked to speak on the topic, and received the Steven Sharp Public Service Award by the Association of Trial Lawyers of America (ATLA) for his work in helping educate the public on the risk of SUV rollover accidents and of the Firestone Tire and Ford Explorer catastrophes. Attorney Bellas will help anyone who has suffered from an SUV rollover accident. He can meet with you free of charge to discuss your legal options. If you have a case, he can fight for you on contingency, charging nothing until you receive a settlement or verdict. Working from our law offices in the Chicago, Illinois area, Mr. Bellas has the experience and knowledge to help anyone in the United States, from New York, Boston, Washington D.C. and Atlanta to Seattle, Denver, San Francisco, Los Angeles, and other areas of California. The tragic thing is that many people drove sport utility vehicles because they seemed safer than other cars. As we discuss in our article Sport Utility Vehicles - Bigger is Not Safer , nothing could be further from the truth. SUVs have very high centers of gravity, making them very susceptible to tipping over. Just a slight change in the SUV's tire pressure can make things even worse. In fact, sport utility vehicles are so dangerous that the government had to create a whole series of rollover tests to account for them. After catastrophic outcome of the recall of Firestone tires on Ford Explorers, Congress quickly enacted the TREAD Act of 2000, which required the National Highway Traffic Safety Administration ("NHTSA") to adopt a test to rate a vehicle's propensity to roll over. This came after 14 years of inaction by NHTSA, which had succumbed to pressure from the auto making industry and had failed to adopt a rollover resistance standard. Although there are no standards, NHTSA has implemented a rollover resistance test to rate vehicles' tendencies to rollover in untripped accident avoidance maneuvers. Although the concept is laudable, the results are only available on NHTSA's website and not published. Moreover, a vehicle can tip up and still receive a safety rating of three out of five stars. This does nothing more than mask the poor performance of top-heavy SUVs and does not resolve the rollover problems with SUVs. Few vehicle recalls have resulted. SUV rollover accident cases, and indeed all cases of auto defects , fall under the legal category of "product liability." Product liability law states that companies have a responsibility to make products that are reasonably safe when used properly. Companies should warn of any foreseeable dangers, and should pay when their negligence causes injuries and deaths. Many SUV rollover accidents have original causes that have nothing to do with the vehicle's propensity to tip over. 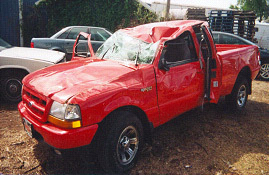 You may swerve suddenly to avoid something, or may be blindsided by a drunk driver -- this could happen to any vehicle. But in a sport utility vehicle, you are more likely to roll over as a result, which will cause much worse injuries. As we discuss in our Increased Risk of Rollover Crashes in SUVs article, more than 60% of the SUV rollover accidents in 1997 caused fatalities. Contact Bellas & Wachowski Attorneys at Law for a free consultation to discuss a possible SUV rollover accident case. We not only do all such cases on contingency, charging no attorneys' fees until our clients are paid; we will also protect our clients' finances with our Total Guard Approach .